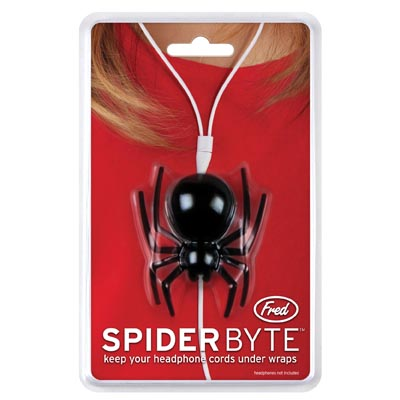 What has eight legs, two headphones, and is crawling up your shirt right now? Spider Byte! This creepy arachnid will organize your unruly cords with spider-like precision. Say goodbye to the tangled web of technology! This works by gently pulling open the cap at the spider's abdomen. Winding your headphone cord around the inner spool until the desired length is exposed, and then aligning the cord through the cut-outs in the cap and pushing to snap the spider shut.